A fully functioning feedwater system is essential for preventing low water shut-down and reducing corrosion and rust. Having a fully functioning feedwater system is essential for preventing low water shut-down and reducing corrosion and rust. At California Boiler, we offer a range of quality boiler feedwater systems and deaerator systems that work with a variety of boiler types. These systems are designed for efficiency to help customers maintain smooth boiler room operations and reduce overall operating costs. We cover boiler systems from 9 HP to over 250,000#/hr and all pressures. For all types of steam boilers with pressures to 300 psig. Open vented feed water systems. Fully piped and wired. Industrial rated. 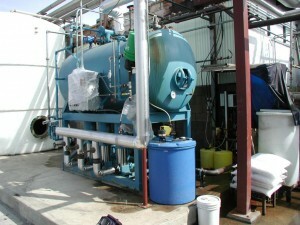 Packaged Deaerator systems, 5,000 to 200,000 PPH. Conditions feedwater to 0% CO2 and .005cc/liter of oxygen. Rite's feedwater return systems are engineered for the safe and efficient storage and pumping of condensate and make-up water back to the boiler.